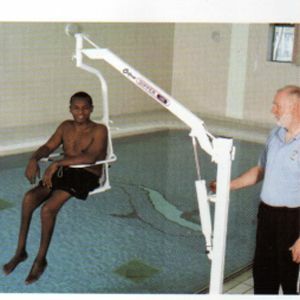 The Dipper poolside hoist is designed for use at swimming pools,therapy pools and quayside locations. 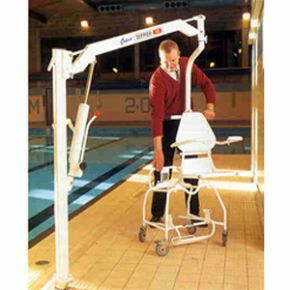 The Dipper poolside hoist is a proven, reliable and safe method of gaining access to and from the water. 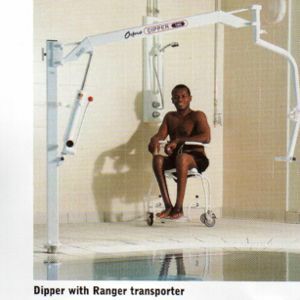 The Dipper hoist can be used with a sling or Ranger seat and transporter. 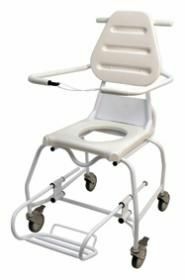 The Ranger transport system provides easy access to the poolside from changing room and can be also used as a toileting or shower chair. Floor Fixing Kit "A" For solid concrete floor. Floor Fixing kit "C" Above floor mounting on solid concrete base where there is insufficient depth of concrete for "A" or "B" fixing kits. We purchased this for use in our therapy centre and are very pleased with this lift and how robust this is. This is used by multiple clients and they have commented how safe they feel using this, we had some questions before we purchased, and they were answered in detail by Active Mobility Centre which gave us confidence that this was being sold to us by very knowledgeable staff. Good delivery time and overall very impressed with the hoist.